St. Peter's stands on the south-west edge of Balsall Common, but aspires to be at the heart of the community and to bring the message of Christ to all who live nearby. It combines a tradition of 'high church' observance with recognition of modern needs and a desire to reach out to all who need Christ. St. John's is a fine 12th Century Norman church built upon the site of an earlier Saxon church. Remains in the crypt date back to the 8th Century. A feature of the church is the two storey gabled and timbered porch added in the 16th Century. The room over the porch is now the vestry but was originally the first school room in the village. The pegs for the boys hats and the benches are still there. St. Mary's was built in the 14th Century as the chapel of the Knights Hospitaller, successors to the Knights Templar. It was left derelict at the Reformation, but was rescued in 1660 by Lady Anne Holbourne, becoming chapel to the famous Almshouses established by her sister, Lady Katherine Leveson, in 1674. 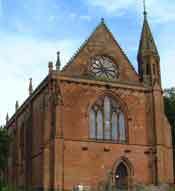 Renovated by Giles Gilbert Scott in the 1840's, it became a parish church in 1863. The Methodist Church, situated in Station Road, Balsall Common, has a strong and valued community presence and seeks to build and develop this. It is part of the Coventry Methodist Circuit. The main service of worship is at 10.30am each Sunday and incliudes Junior Church, Young People's Fellowship and Creche . Housegroups meet on weeknights. Details of all services, preachers and activities can be seen on the circuit website. Please join us; you are very welcome! This new church was built on the site a former church, St Philomena’s, in 1994, and was dedicated in December 1995, receiving the Solihull MBC’s Design Award for 1995. It is named in honour of Robert Grissold, who was born in nearby Rowington between 1550 and 1560, and was hanged for his beliefs, together with the priest Father John Sugar, at Warwick on 16 July 1604. The present St. Swithin's church was built between 1721-1727 on the site of an original church burnt down in 1721 which had its origins going back to the 11th Century. The Georgian building was extensively altered to suit Victorian tastes about 1897. A warm welcome is offered to our services, in which we try to combine the best of both traditional and modern worship - our aim is that every service will have something for everyone, both young and old. Worship and teaching in church is "all-age" - suitable for children, young people and adults - and there are also separate learning groups for our younger members. We also provide a crêche for babies and toddlers. On 1st September 1990, churches in Britain and Ireland set out on a new stage of their journey - in search of the unity for which Christ prayed and in common evangelism and service of the world. For the first time there was a body in England representing a wide range of churches: Anglican, Black-led, Free Churches, Orthodox, Roman Catholic, as well as many smaller churches. In common with other similar groupings, Balsall Common and Berkswell Council of Churches decided to prepare a constitution, which reflected the new national developments. 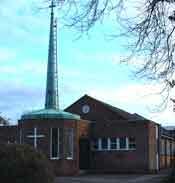 Its membership consisted of St Peter's Church of England, Balsall Common, St John Baptist Church of England, Berkswell, the Methodist Church in Balsall Common and St Philomena Catholic Church in Balsall Common. In 1994 a new church, dedicated to the memory of Blessed Robert Grissold, replaced the latter. Later the group took on another dimension, when it was joined by St Mary the Virgin Church, Temple Balsall and changed its name to Churches Together in Balsall and Berkswell. to work and pray for Christian unity in association with Birmingham Council of Christian Churches and Coventry and Warwickshire Ecumenical Council. to enable the churches to live and share the Gospel, to evangelise together and to take further steps towards fuller unity. Relationships Churches Together in Balsall and Berkswell is in association with Birmingham Council of Christian Churches (www.birminghamchurches.org.uk) and Coventry and Warwickshire Ecumenical Council (Tel. 02476 352551). Membership Membership of Churches Together in Balsall and Berkswell is open to any local church in the area, which affirms the Basis and commits itself to promote the aims of Churches Together in Balsall and Berkswell.